Someone was wondering what would happen if someone picked up Sans around Papyrus and tried to walk off with him, which prompted this quick silly doodle. Sans only gets carried when he wants to get carried. This is an interesting twist on Little Blue Riding Sans. Did I just witness attempted child kidnapping? Well Sans is an adult. So just just witnessed attempted adult kidnapping. But yes. Yes you did. True. 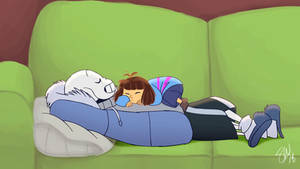 Sans is smol. Smol Sans. most of the royal guards/sentries we've seen in Undertale are dogs.... new reason why Pap shouldn't be in the royal guard. (first reason was he's too innocent and could get hurt very easily because of that, even though he's strong. exiting a room then- what? It's a reference to a video about beating some Super Mario 64 level with half an a press or something, I can't remember what the exact video was called. 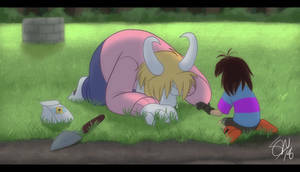 I have a theory that the reason you only see those two skels in the whole game is because of this exact scenario with the various breeds of dog-monster. 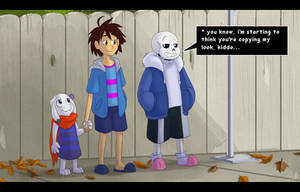 Sans' only fear is seeing Pap taken by the dogs. She probably just wanted to wake him so he'd make a few bones for her. They produce them in their attacks, after all, and monster food, like the bones, is made of magic. Taste SM64 speed running reference. What was she gonna do? Chew on him for being made of bones? I wish I could teleport like that...It would be SO dang useful. it'd be so easy to shoplift. Also useful for trolling people,For example your fighting and just when somebody is about to hit you,you just teleport behind him/her and continue this till he/she gets sick of being trolled. Maybe if he felt in danger. he doesnt HAVE to attack though? he can just use a shortcut away or something. sans was only ever violent once in ut, and thats when he was one of the last monsters. Thought this was Toriel till I noticed the tail. That is an adorable Dogaressa! I am slowly dieng inside.